When you see the name of Miles Grayson on a 45 label it's usually a sign of quality - and this single by Little Henry is yet more proof of that assertion. (Baby) Come To Me sits somewhere between doo wop and deep soul and is none the worse for it. Henry Houston sings with plenty of gusto and the Shamrocks contribute some fine "ooohs" and "aaahs" in the background. The rap in the middle is pretty good too. 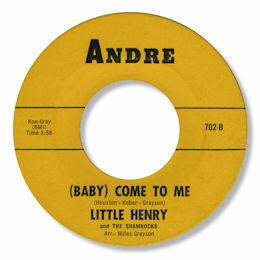 The 45 was picked up by Kent from Freddie Lee Kober's tiny Andre label. Note ~ "(Baby) come to me" can be found on the Kent UK CD "Slow 'n' moody black and bluesy" and " The ta ta song" on the same company's "For connoisseurs only vol 3".